In the wake of British hero Donald Campbell establishing an Outright World Water Speed Record in his jet hydroplane Bluebird K7 of 202.32 mph / 325.60 km/h, back in 1955, the decades that followed witnessed a succession of international teams achieving ever quicker times and subsequently gaining the coveted accolade of the fastest boat in the world upon water. The current record of 317.18 mph / 510.45 km/h was set by Australian Ken Warby in Spirit of Australia in1978. The four decades since then represent by far the longest period that the record has remained unsurpassed. With the ultimate intention of bettering this impressive mark, ‘Longbow’ Project Leader, David Aldred has brought together a serving British military pilot, Lt. David-John Gibbs RN, as driver for the craft, and a team of British experts with a joint passion to design, develop, build and successfully run their jet hydroplane Longbow given it has been 50 years since a jet hydroplane has run at speed within the UK. Once constructed this craft will hopefully be a learning platform and basis for a credible attempt to challenge the Outright World Water Speed Record. David Aldred explained. “A jet hydroplane can be described as a pure thrust gas turbine or rocket powered boat, with a hull designed in such a way that when high speeds are achieved, the craft only has a few square inches of its surface in contact with the water surface, which in turn reduces hydrodynamic drag to a minimum”. Historically the governing body for such Outright World Water Speed Record attempts has been the Union Internationale Motonautique (UIM), similar to the FIA for certain Land Speed Record Attempts. As part of the UIM rules there are guidelines for driver cockpits to comply with. The designers of the craft, with assistance from Swansea University, require a Non-uniform rational basis spline (NURBS) mathematical model of the driver cockpit to enable investigations for structural integrity to be undertaken. NURBS provides high levels of precision and excellent flexibility for handling both analytic and modelled forms. A major contributor to the Longbow project is Kevin Hardcastle, design engineer and founder of Aximo Ltd, a product and mechanical design consultancy. Kevin’s acknowledged expertise and considerable experience in a range of relevant 3D CAD and CAE tools, has been invaluable in assisting with the design of the craft. 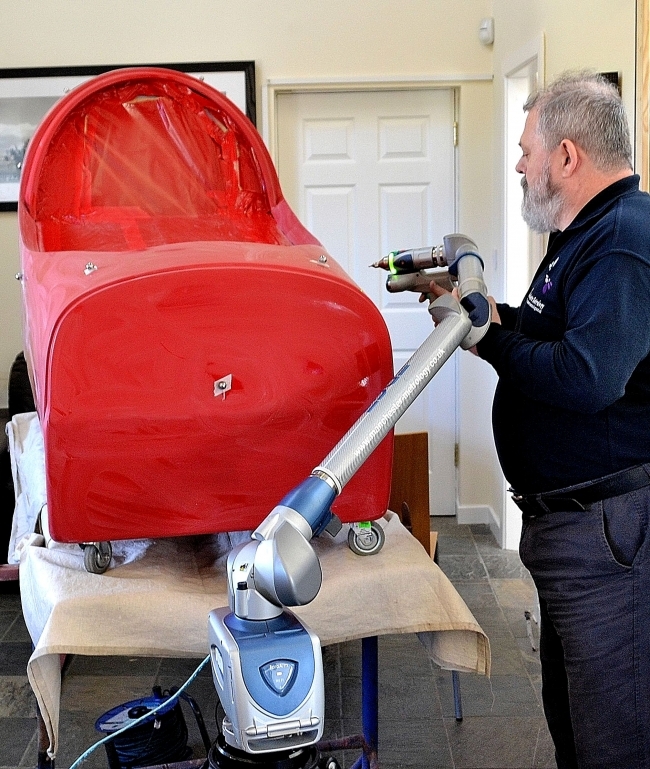 To enable Kevin to produce the required drawings for analysis of the driver cockpit from the buck already fabricated, the assistance of Manchester Metrology’s laser scanning services was enlisted. 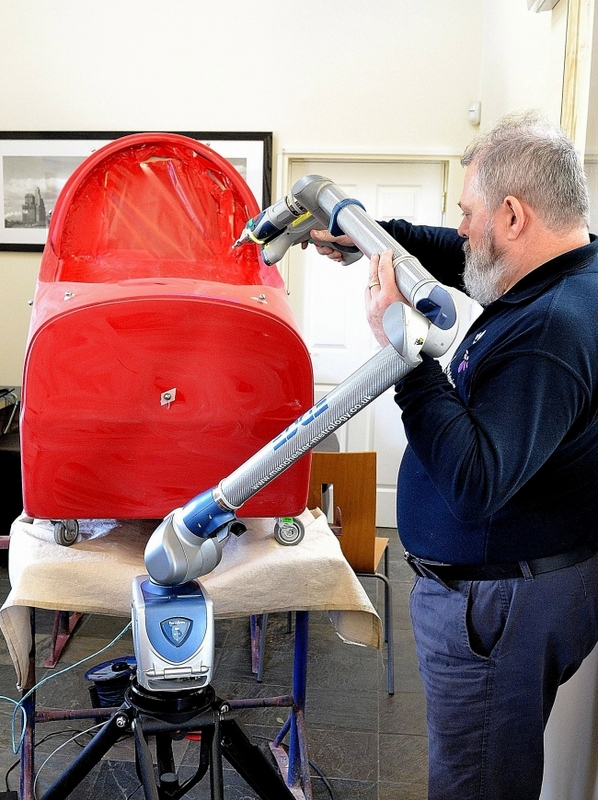 Given the project’s demanding accuracy requirements, Neil Blakeman of Manchester Metrology used a FARO Edge ScanArm HD to scan the drivers tub and to capture the required data for conversion into a NURBS format. Neil said. “Manchester Metrology offer specialist contract measurement services using the latest metrology technology and provide support both in the UK and worldwide. Given Longbow’s challenging accuracy requirements we decided to use the FARO Edge ScanArm HD to scan the driver’s cockpit, as it has an accuracy specification of ±25μm. The Edge ScanArm HD combines the flexibility and functionalities of a FARO Edge measuring Arm with the high-definition Laser Line Probe HD, the kind of powerful contact/non-contact portable measurement system that is ideal for challenging applications such as Longbow. “Also, as each of Longbow’s team of experts and technical contributors have ‘day-jobs’ and give their time voluntarily, it was important to use a technology that could capture and process the required precise data in a timely fashion. The FARO Edge ScanArm HD can be described as the complete measurement solution, it uses laser and hard probes seamlessly to inspect freeform surfaces, significantly increasing the efficiency of inspection processes. The advanced FARO system delivers rapid point cloud collection with extreme resolution and high accuracy without the need for special coatings or target placement – all in a compact and easy-to-use system. The creation of an extra wide scan stripe and the benefit of a fast frame rate boost productivity by increasing coverage and reducing scanning time. Intricate components can be captured in fine detail as a result of the 2,000 actual points per scanline and the new blue laser featuring noise reduction technology. Users can dramatically reduce training time with the new crosshair feature and the existing LED Rangefinder functionality, which provides real-time scanning feedback. The Edge ScanArm HD is the most affordable, high performance contact/non-contact measurement system and is ideal for product development, inspection, and quality control and offers capabilities such as point cloud comparison with CAD, rapid prototyping, reverse engineering, and 3D modelling of free-from surfaces. In addition to the Edge ScanArm HD boasting an impressive accuracy specification, it has a rapid scanning speed of 280 frames/second, 280fps x 2,000 points/line = 560,000 points/sec. The unit’s extra wide scan stripe and fast frame rate boosts productivity by increasing coverage and substantially reducing scanning time. Now, intricate components can be captured in fine detail as a result of the 2,000 actual points per scanline. A new crosshair feature and existing LED Rangefinder functionality dramatically reduce required training time and provides real-time scanning feedback, whilst the small size and friendly user-interface result in a versatile and intuitive tool. Longbow Project Leader, David Aldred concluded “Although we have already made significant progress, the Longbow project is still in its design and prototype phase. As this foundation period is fundamental to the ultimate success of the project, the considerable expertise and hard work of Kevin Hardcastle of Aximo Product Design Consultancy has been invaluable. 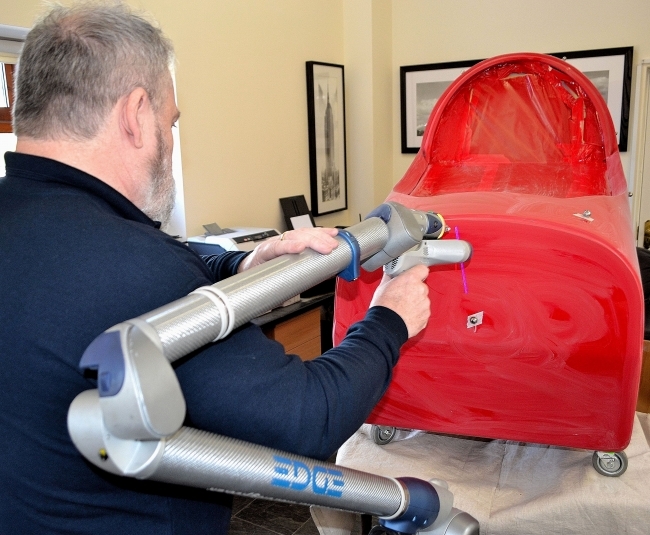 In addition the much appreciated assistance of Manchester Metrology and the company’s use of FARO’s Edge ScanArm HD has enabled the project to make another major leap forward.